Wahama freshman Lauren Noble (30) passes to sophomore teammate Victoria VanMatre (3), during the Lady Falcons’ 48-41 victory on Wednesday in Mason, W.Va.
Wahama freshman Bailee Bumgarner (left) drives by Trimble freshman Ashlynn Hardy (right), during a fast break in the Lady Falcons’ 48-41 victory on Wednesday in Mason, W.Va.
MASON, W.Va. — Soaring from the start. 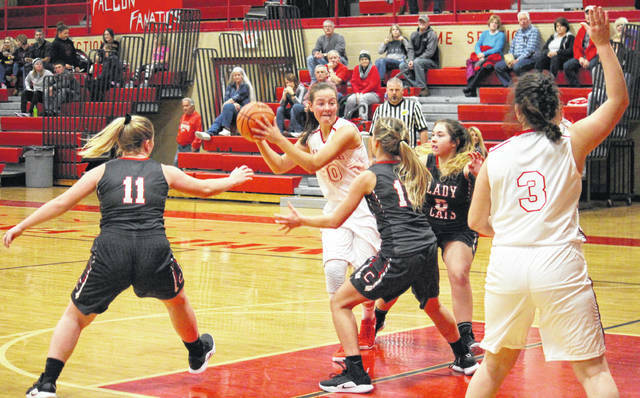 The Wahama girls basketball team began its 2018-19 campaign in style on Wednesday at Gary Clark Court, as the Lady Falcons claimed a 48-41 victory over Tri-Valley Conference Hocking Division guest Trimble. The Lady Tomcats (1-2, 1-1 TVC Hocking) pounced out to a 6-1 lead, holding Wahama (1-0, 1-0) without a field goal for the first four minutes. However, the hosts ended the first quarter with an 10-4 run and an 11-10 lead. Trimble began the second quarter with a 6-2 spurt and led 16-13 by the midway point of the period. WHS took the lead back with an 8-1 run, and the Lady Falcons headed into the half with a 22-17 edge. 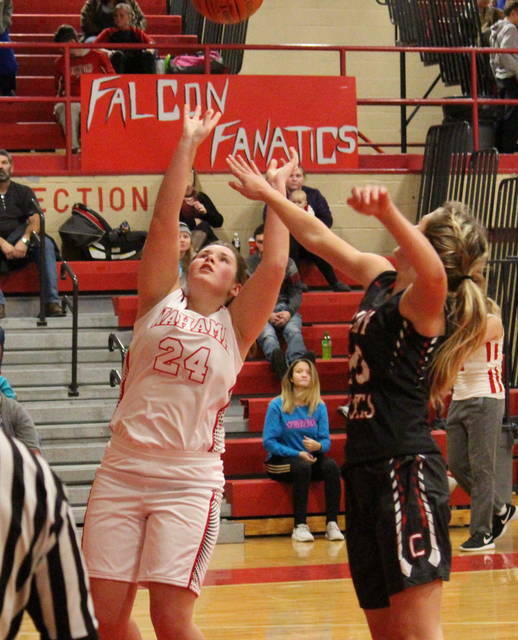 The Lady Falcon lead grew as high as 12, at 31-19, in the third quarter, but Trimble trimmed the margin back to single digits, at 31-22, by the end of the stanza. The guests battled to within three points, at 43-40, with a minute to go, before a Wahama two-pointer made it a five-point game with 55 seconds to play. 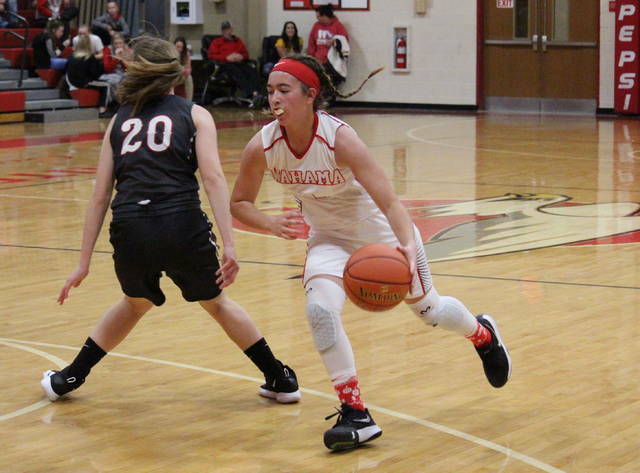 The Lady Tomcats hit 1-of-2 free throws with 21 seconds to go to make it a four-point margin, but Wahama sealed the 48-41 victory by making 3-of-4 from the line. Following the triumph, fourth-year WHS head coach John Arnott was pleased with the victory, but noted that the way his team won made it even better. Arnott acknowledged that his team didn’t play the perfect game, but that it’s expected with the first game of the year. In the win, Wahama shot 17-of-36 (47.2 percent) from the field, including 1-of-3 (33.3 percent) from three-point range. Meanwhile, the Lady Tomcats shot 14-of-57 (24.6 percent) from the field, including 1-of-17 (5.9 percent) from deep. At the charity stripe, WHS was 13-of-27 (48.1 percent) and THS was 12-of-18 (66.7 percent). The hosts won the rebounding battle by a 38-31 clip, despite Trimble claiming a 15-to-14 edge in offensive boards. The Lady Falcons combined for 11 assists, 10 steals, one blocked shot and 28 turnovers, while the Lady Tomcats marked team totals of seven assists, 16 steals, one block and 20 turnovers. 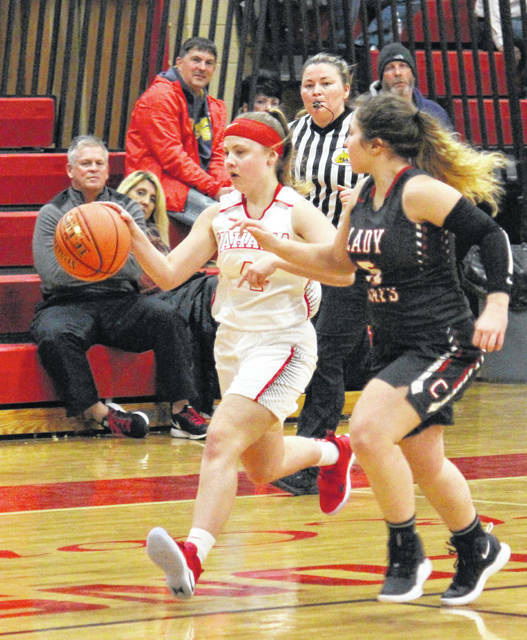 The Lady Falcon offense was led by Hannah Rose with 25 points — featuring nine two-pointers and one triple — to go with three assists. WHS sophomore Emma Gibbs recorded a double-double of 14 points and 13 rebounds, while Harley Roush added five points and seven rebounds. Victoria VanMatre and Bailee Bumgarner rounded out the WHS scoring with two points apiece, while Lauren Noble finished with three assists and team-highs of six steals and a block. Jane Six led the Lady Tomcats with 13 points, followed by Laiken Imler with 10. Emily Young tallied eight points, while Brianna Osborne recorded eight points, eight rebounds and a pair of assists. Skylar Moore picked up three points on the team’s only long-ball, Ashlynn Hardy chipped in with two points, while Riley Campbell had one point and two assists in the setback. Imler led the THS defense with seven steals, while Osborne had a block. Wahama will go for the season sweep of THS when these teams will meet in Glouster on Jan. 14. After a trip to Eastern on Thursday, Wahama will be back in action on Monday at Southern. https://www.mydailyregister.com/wp-content/uploads/sites/24/2018/12/web1_12.7-WAH-Noble.jpgWahama freshman Lauren Noble (30) passes to sophomore teammate Victoria VanMatre (3), during the Lady Falcons’ 48-41 victory on Wednesday in Mason, W.Va.